Tarheel Nursery brings you a huge selection of homegrown flowers and plants, spanning a huge range of colors, styles and seasons. Come to us for annuals, perennials, bedding plants, hanging baskets, vegetable plants and garden seed, as well as general green thumb supplies. We aspire to deliver the best quality products at the best price. Visit today or contact us about retail and wholesale orders. Whether you’re a self-proclaimed green thumb or just love the look of healthy plants and flowers in your garden, Tarheel Nursery welcomes you. Our nursery in Angier, NC has hundreds of different plants to choose from and we’re sure you’ll find your favorites no matter what they are or what season they thrive in. We take pride in growing healthy plants all year round, delivering them to our customers at the very best prices. 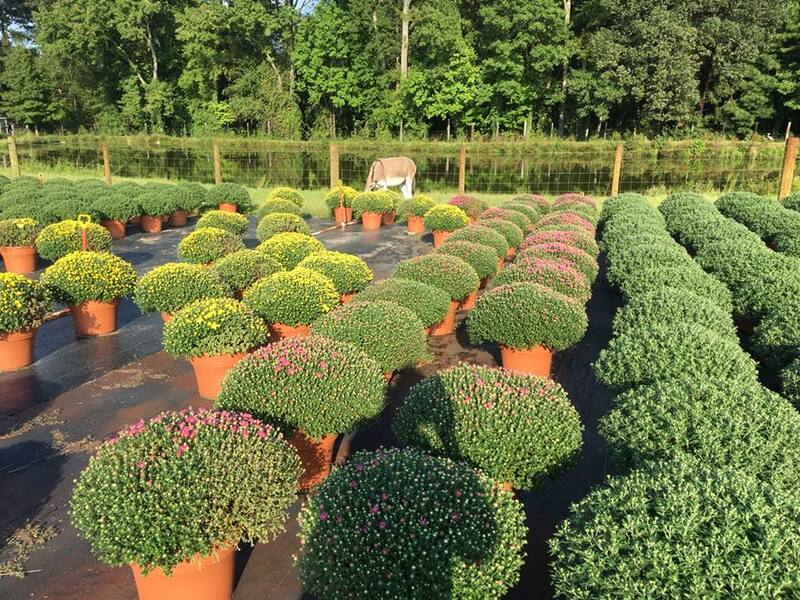 All the flowers and greenery in our plant nursery in Angier, NC are cultivated and tended by our expert staff, ensuring you’re walking away with a plant that’s ready to thrive. Because of this, we’re also able to recommend the right care products and insights. We’ll help you discover your own green thumb! Shop us for your total garden needs—from plants and seeds, to soil and potting supplies. In addition to an extensive retail selection, we’re also the go-to supplier for flower wholesalers in the region. We offer great rates and prices, as well as delivery services. We serve the needs of landscapers, flower shops, nurseries and more throughout the region. Whatever your customers demand, trust us to supply it. At Tarheel Nursery our rich history ties us close to our community. For decades we’ve been helping people beautify their gardens and embrace nature. We look forward to even more decades of the same ahead. Whether you’ve bought plants and supplies from us before or this is your first time, know that we welcome you as family. Visit us today and let us help you find the perfect plants at a great price. Our many varieties of flowers and plants are available in both retail and wholesale capacities. We’re a trusted regional distributor for landscapers. We strive to keep costs low and maintain affordability, without compromising on the caliber of plants we sell. Count on us to grow the best and sell for less! We’re able to provide delivery for bulk orders. Our delivery service area ranges throughout most of Northern, Eastern and Southern North Carolina. We maintain an A-plus rating with the Better Business Bureau of Eastern North Carolina. We’re also a member of the Algier Chamber of Commerce. We’re a member of the North Carolina Flower Growers Association (NCFGA) and proud to be a locally-owned and -operated nursery. There’s no end to the number of beautiful blooms and seasonal delights you’ll find at Tarheel Nursery! Visit us today to browse our selection of flowers, plants, supplies and more! April 19, 2019 Neil E.
April 15, 2019 Linda C.
"Love this place lots of beautiful flowers and cheap prices." April 15, 2019 Lisa S.
"Best place for perennials and annuals!" April 2, 2019 Connie G.
"Awesome people to work with. We do a fund raiser with their Poinsettias each year. Beautiful flowers and professional people. Thank you for ..."
April 2, 2019 Eric J. "We buy wholesale for our hardware stores. We get so many compliments on our plants and we're proud to sell local product. They use better so..."